I've joined a research project at Stanford University (my alma mater). I am working with a small team to build a platform for on-line education. This post explains what we're building, my part in it, and why this is an interesting area right now. We are building Class2Go, an application to put Stanford classes on line. Envision a video-driven web site with exercises and tests. It will run much like a class today (professors, TA's, lectures, homework, tests, schedules) but with everything happening on-line. 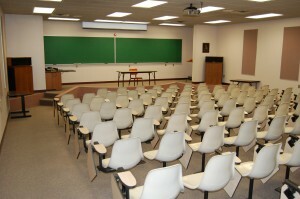 For some kinds of classes this could improve the classroom experience for enrolled students; the excitement comes when you can bring in the a much larger set of non-enrolled students. The professors who have expressed interest so far are those who want to flip their classrooms or host a Massive Open On-Line Course (MOOC). Others have ideas on experimentation with the learning process itself. For example, do students learn better when they see slides, a talking head, or both? A large enough student population makes meaningful studies possible and cheap. There are a bunch of features needed over and above basic basic video. First, can we devise a good system for students to grade each others work? This is an absolute must to do anything in the humanities at large scale. We have some ideas of how to do peer evaluation, but it's an area that needs much more experimentation. A second important feature is enabling off-line use from laptops and tablets. When we think of disconnected students we typically think of commuters, but we've heard it's just as important (or maybe more so) for students in developing countries where bandwidth is precious. Research will be first and foremost. Hey prof, you want to do a wacky experiment? We can help. Value produced by the course is retained and controlled by the professor and the university. That value comes from the assets (video, homework) but even more so the community and technology. The professors will have quick and ready access to their data. No waiting in lines for reports. Part of what makes this doable is that there are so many great building blocks available. We plan to use YouTube for video and the Khan Academy framework for exercises. Piazza has great discussions and forums to start with. Because of all this good stuff, we feel good about getting something strong out by the Fall for a couple of courses, and then expanding from there. And me? I'm the line manager. It's fun to work on a project of this size where I can keep my hands dirty. For example, this week I'll be working on authentication (oauth). Two things brought me to education. Firstly, education is uniquely important. I challenge you to name another human pursuit that is as important, consumes so many resources (for good reason), and can be so transformative when done well. The other two that come to mind are health and agriculture. But I'd say education is right up there. And second, education is changing right now. Of the meetings I've had while on sabbatical some of the most interesting have been about education. Why can't information technology have as big an impact on how people learn as it has had on everything else? Technology could mean making it available to to many more students, in different places and of different means. Educators could spend less time lecturing (dry stuff, to be sure) and more time working with students. Better measurement and analysis and could give educators near-real-time feedback and students tailor-made homework. Those are just a few of the examples that I heard about that got me excited. I look forward to doing something that will make even a little difference here. I'll blog about my experiences along the way. PS - Peter Norvig's TED Talk captured the reasons and potential nicely. That seven minutes is worth your time.